Whilst I was pregnant with Noah I was so blissfully unaware of just how much hair you can lose once you enter the postpartum period. I don't ever recall being warned about it once, not even from those who had babies themselves, it was the thing everyone forgets to mention. I can't lie in saying that it didn't knock my confidence to see my hair falling out in clumps so often that I was left with actual patches of missing hair. I began to wonder if there was something more wrong as I just couldn't believe how bad this could be, yet not one healthcare professional mention it during your nine months of pregnancy. I first noticed my hair loss around 4-5 weeks after birthing Noah, I have very thick curly hair so shedding quite a lot wasn't unusual for me. My hair type never changed throughout pregnancy, so to suddenly be waking and finding fistfuls of hair on my pillow was pretty alarming to a new mum so blissfully unaware to postpartum hair loss. Even at my 6 week check up I kept schtum, actually wondering if being so sleep deprived and potentially stressed, was causing the issue. Around 10 long weeks later, I realised through seeing others having babies around the same time discussing it, that actually this was so very normal. I wasn't losing my mind, everything was genuinely ok, it was just 'one of those things', which unfortunately, nobody spoke about. Fast forwarding to last year and giving birth to Patrick, I was fully braced for what would lay ahead, but it took a whole 11 weeks before I had anything similar to first time around. I even began to feel a little smug that I might miss all of that after baby number two but I was completely wrong, it was worse, way, way worse and lasted a hell of a lot longer. Only now around 10 months later do I feel my hair has half recovered from the loss it suffered post-Patrick. It looked as if I had a receding hair line due to the huge amount of loss at the front of my hair, even now it's just small 3 inch tuffs of baby hair. So why is it never spoken about? In all honesty, I think so much goes on initially postpartum after having a baby that we as women forget. 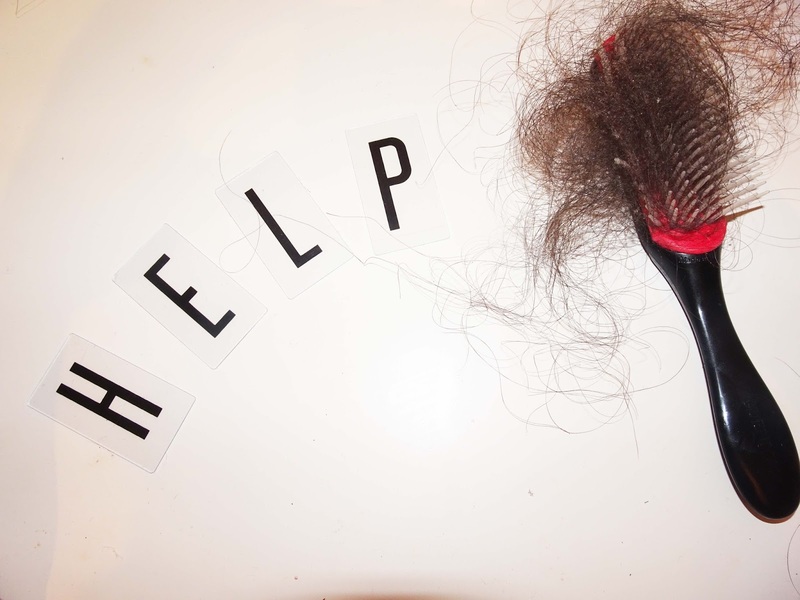 Hair loss isn't an instant thing, it usually happens within one to two months after giving birth and I think by that time Mums are expected to just be getting on with life. Moaning about hair would seem trivial in the grand scheme of parenthood, but it really did knock my confidence as a new mum. I couldn't exactly rock a mum bun when I had huge clumps of hair looking - I didn't want to face questions of people asking what was wrong. Of course, when I didn't know the cause, some complete worse case scenarios went through my mind thanks to googling my symptoms. (Never do this, google is not your friend, or doctor) and I guess I just wanted to write this to raise a little awareness and let other parents out there know that actually, this does happen and it is a big deal. I think I am lucky that I didn't lose any hair when pregnant, I think it got thicker which is bad as it's awful to control anyway. I don't understand why this happens! It's so annoying, and no one really tells you about it before you have the baby.. I actually had suffered this, throughout pregnancy my hair grew thick and strong, as well as my nails. Fast forward a few months after giving birth, I too noted hair loss and that new sheen had faded. I know it al due to hormones, but this was not stage I was prepared for. I understand that are bodies and lives go through so much, but it would of been nice to of touched on the subject, be to from my midwife or not class.